After 257 Mystery Seed of the Week posts, it seemed like it was time for a change. But what to do next? The answer was inspired by a book, Seed to Seed: The Secret Life of Plants by Nicholas Harberd. Seed to Seed is the journal of plant geneticist Nicholas Harberd from the year 2004. In it, he records his personal observations and discoveries. Because of his prominence in the field, in many ways it is also the story of the uncovering of the genetic control of plant growth. Right in the first entry in the book, Harberd reveals that over the last few decades plant scientists have decided on a unifying method to help move the field of plant genetics forward more quickly. Instead of trying to examine a little of the genetics and development of many, many different plants, perhaps it would be more enlightening for everyone to study one plant thoroughly and assume that the other plants probably had the same or similar properties. 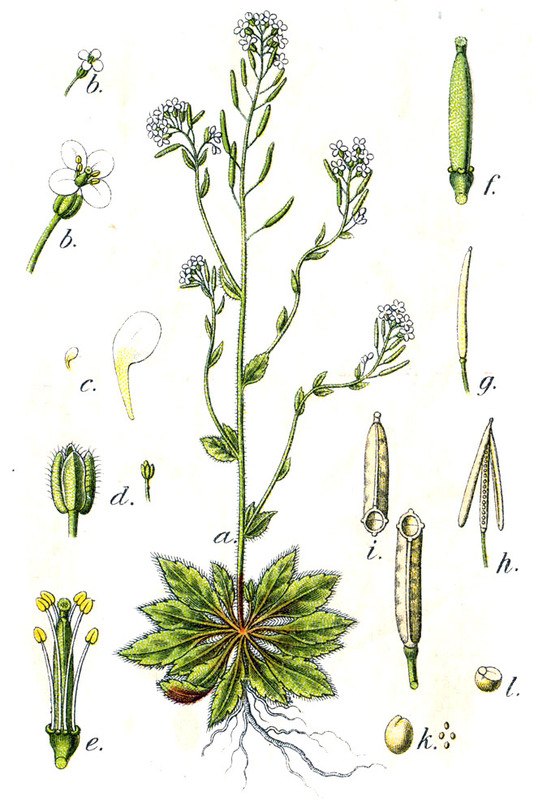 The plant they chose to investigate was thale-cress, Arabidopsis thaliana. Why did they select this small weedy plant? Arabidopsis thaliana is the lab rat of the plant world. It is small and it self-pollinates, so it can be grown easily in the lab. 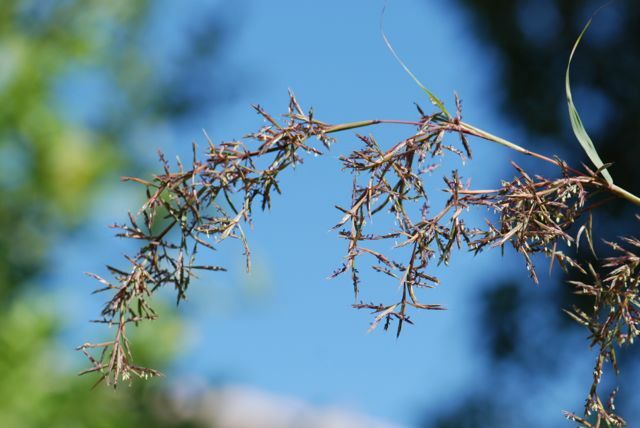 It completes its life cycle quickly, producing flowers within approximately three weeks and seeds in about six weeks. In addition, thale-cress has a small genome that has been completely sequenced, so geneticists can build on what is already known. Where does this unifying idea take us? Rather than moving randomly from plant species to plant species as we have been doing with Seed of the Week up to now, let's change gears. 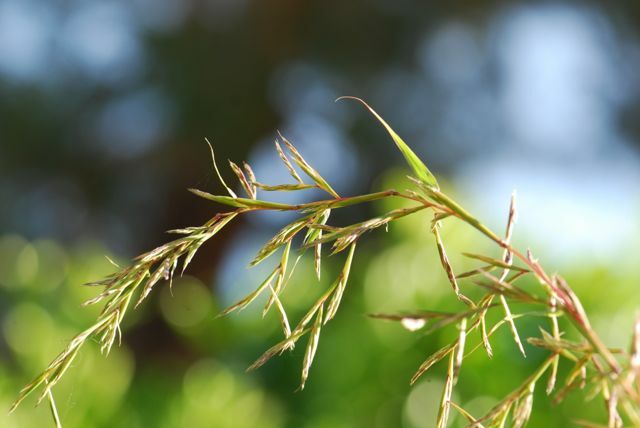 Following in Nicholas Harberd's footsteps, let's learn more about plant science by delving deeply into the secrets of a single type of plant over the next few months. Who knows what we might find out! What do you think of this plan? Would you like to join in the journey? What questions about plants would you like to answer? Our mystery seeds from last week were from West Indian lemon grass, Cymbopogon citratus. Too bad today's post can't come with a scratch-and-sniff component. Lemon grass, although not related to lemons, has a lovely lemony scent. It is used in Asian cooking, particularly Thai, and also in teas. Both West Indian and East Indian lemon grass grow well in the Southwest because they are drought and heat tolerant. They are, however, frost sensitive and the brown ends may need to trimmed back after a cold winter. The plants do well growing in pots and can be temporarily moved indoors if necessary. Lemon grass plants are easy to propagate. Many Asian markets sell lemon grass stalks, so look for some with the bulb and a few roots still intact. Simply stick the root/bulb part of stalk into moist soil for rooting. 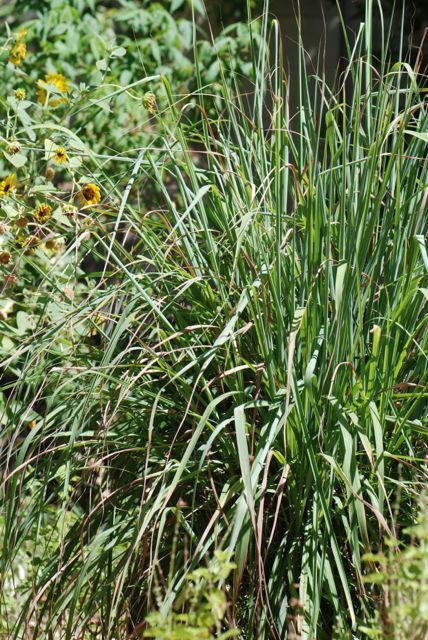 It is also possible to separate and move the stalks from an established clump of lemon grass. Depending on the species, the plants may periodically produce flowers. 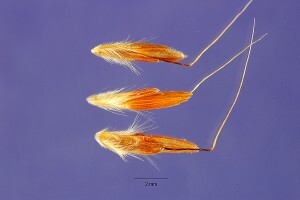 The flowers are fairly inconspicuous, as with other grasses. Over time they turn reddish brown as the seeds form. Simply sow the mature lemon grass seeds into moist soil for new plants. Before you know it, you will be catching the delicious citrus scent as you brush by the plant. 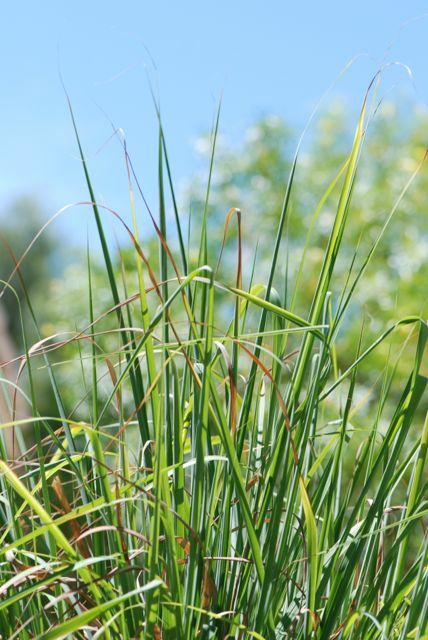 Have you ever grown lemon grass? What is your favorite recipe for using it?